A well presented and spacious semi detached house in the popular location of The Willows. The accommodation consists of a double mezzanine bedroom, lounge, kitchen and bathroom. The property is double glazed and gas centrally heated with a garage, driveway and large garden. The property has potential to convert the garage into a 2nd reception or bedroom en-suite subject to the necessary planning permissions and is offered for sale with no onward chain. DESCRIPTION Located within The Willows is this semi detached house which offers scope for extension subject to necessary planning permissions. 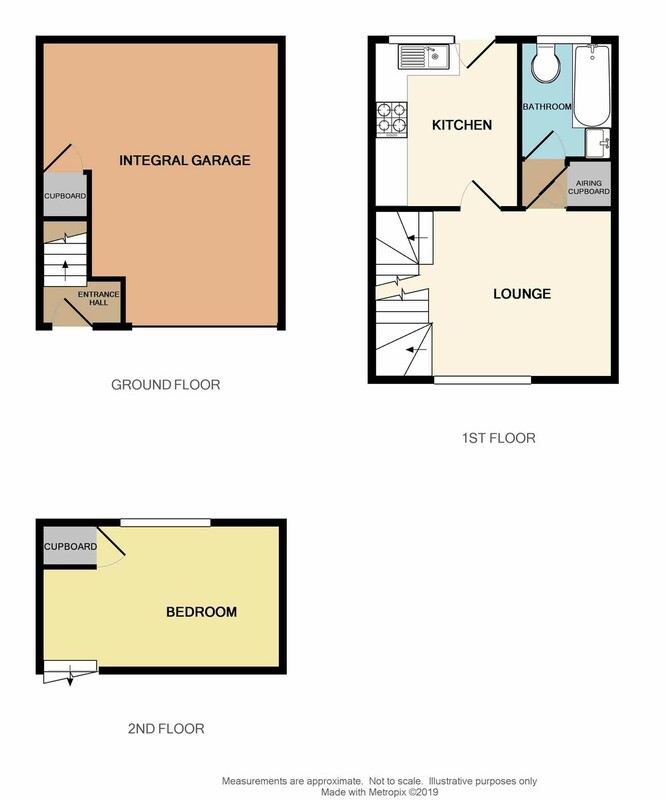 On the ground floor is a spacious integral garage, on the 1st floor is a lounge, kitchen and bathroom. On the top floor is a double mezzanine bedroom. The property is double glazed and gas centrally heated and comes with the added benefit of a driveway and large rear garden. KITCHEN 10' 5" x 9' 2" (3.194m x 2.802m) Fitted with a matching range of wall and base mounted units and drawers with roll edge work surface over. Single bowl stainless steel sink unit with mixer tap. Fitted gas cooker, spaces for washing machine and fridge. Radiator, double glazed window and door to rear. BATHROOM Fitted with a modern matching 3 piece white suite comprising of: Panelled bath, low level WC and pedestal wash hand basin with light over. Extractor fan, radiator, double glazed window to rear. BEDROOM 13' 11" x 9' 1" (4.256m x 2.779m) A mezzanine bedroom overlooking the lounge. Double glazed window to rear, radiator. Cupboard housing the central heating boiler and access to eaves storage. GARAGE 17' 10" x 13' 10" (5.436m x 4.233 maxm) Up and over door, power and lighting, under stairs storage cupboard. This garage could easily be connected to the main house with the potential to be a further reception room or bedroom.